Do you want to make your own homemade 5 hour energy drink recipe? The recipe below will help yo make a vegetarian version of a 5 hour energy drink like you can get in the stores, but for less money, and with better health benefits. This recipe isn’t exactly like what you get with a store bought 5 hour energy drink exactly. The store version has vitamin B12 which you can not get from plant sources, but if you really want to have something almost exactly like 5 hour energy you can simply take a B12 tablet with your juice. This juice comes out really sweet tasting thanks to the apple and sweet potato. 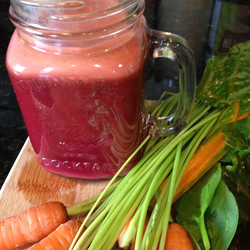 So juice up a batch and get some extra energy to get through the day.